TrustVeterans.com - A Veteran's Take: Houston Texans, plus... found a home! Houston Texans, plus... found a home! 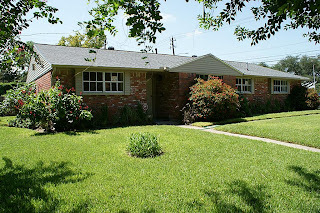 A great 1960's renovated property with Travertine and hard wood throughout. So, good news all around for me today! I made an offer on a home in southwest Houston and the seller accepted! This is great news for my family and I as we are really ready to get out of an apartment and get back into living in a home. It is in a wonderfully established, older neighborhood, with clean streets and quite neighbors. My home search will only be completed when the seller hands me the keys and the property is transferred into my name at closing. Previously, we ran into a problem that came up only after an inspection was done on the home that we walked away from out in the Katy, Tx area. So I will keep my fingers crossed that everything about this transaction goes smoothly. As a Veteran, I will always have my earnest money protected, and my realtor is working to ensure that throughout the negotiating process, all the items which are a concern for my family and I are addressed. In other positive news, the Houston Texans replied back to me this morning as well about my photo's and approval of the set. The Texans cheerleaders were on hand to support the troops! Thankfully, only two did not make the cut, but that's perfectly ok! They did not add anything of real value to me telling the story. So no issues with deleting them. I can understand that if professional sports is your business, you never want to take a chance that some of the plays you run during practice would be seen on the internet by an opponent and possibly deconstructed for a strategic advantage. The same reasoning holds true, albeit on a different scale, with photographing classified combat operations. I would never shoot photographs that could reveal tactics or procedures related to how we fight or maneuver. When any military unit loses a tactical advantage, it could prove deadly, or for a professional sports team it could lead to losing which depletes revenue. The Wounded Warrior Project and the USO were both on hand yesterday afternoon leading the festivities in partnership with the Lady Texans, the Lone Star Veterans Organization and of course, photo support from me at Security America Mortgage. I feel honored and privileged to be granted access to document the event and I will do my best to serve the Veteran community of Houston in all the ways I can throughout the coming months and hopefully years to come. Thank you Evan at the Texans!